Born in Osaka, Japan, Tsutomu began practicing Bon Taiko at the age of 3 under the instruction of his father, an Ondo Tori (meaning, "singer who sings on top of the Yagura at Bon Dance Festivals"), and a Taiko drummer. He debuted as a performer at the age of 10 where he played taiko in local bon festivals around Osaka. More than 30 years later, he still hasn't stopped. Over the past 32 years, Tsutomu has exposed himself to and mastered a diverse range of Taiko styles, aiming to become an "almighty" Taiko performer. His experience includes performing a wide range of pieces originating from many areas of Japan. He specializes in a performance style called Katsugi Oke Taiko, in which he plays Oke Taiko, made with horse skin hanging from his shoulder. In addition to his solo skills, he also enjoys ensemble performances with his teammates employing a wide variety of different Japanese taiko drums. In Osaka, Tsutomu founded a group called "Wa Taiko Yu," and performed with them on many stages. In 2005, along with his co-members of the Neyagawa Junior Chamber, he established "Wa Taiko Sasuke" and began teaching those who had never played Taiko before as an instructor. 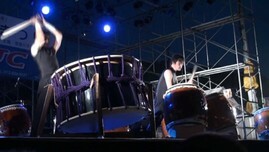 Since then, Sasuke has become a popular Taiko team which performs on over 20 stages annually in Japan. In November, 2009, he planned and produced the very first Neyagawa Wa Taiko Festival, which became a great success with over 1,200 in attendance and has been continuing every year since then. Tsutomu does not only perform as a member of both Yu and Sasuke, but also serves as the master of ceremony for the festival. With his unique style and strong passion for sharing Taiko with the world, Tsutomu moved to Hawaii in 2012 to open his new Taiko school, Dragon Beat.